Small space? 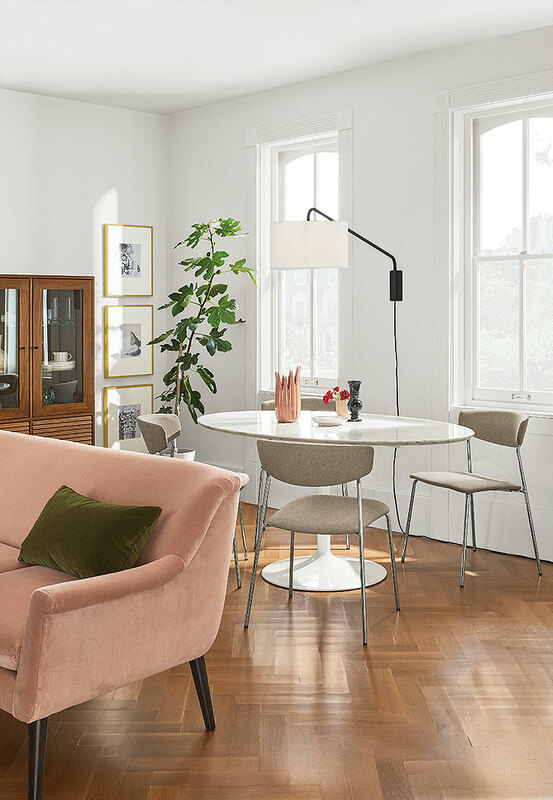 Save some square footage with these new, uniquely designed space-saving storage solutions for any room in your home. Our Linear wall-mounted nightstand’s unique design and wall-mounting system means you can hang this nightstand on any wall. You’ll love the refined, yet durable design, which features details like dovetail joinery and handcrafted hardware, all indicative of expert technique. For the kitchen, our Portica counter table with a narrow shelf features a fixed shelf that is the perfect distance from the counter table’s edge to tuck in stools and still provide ample storage. If you wish for more kitchen storage, go for the Portica counter table with two shelves, perfect for storing food or kitchen items. 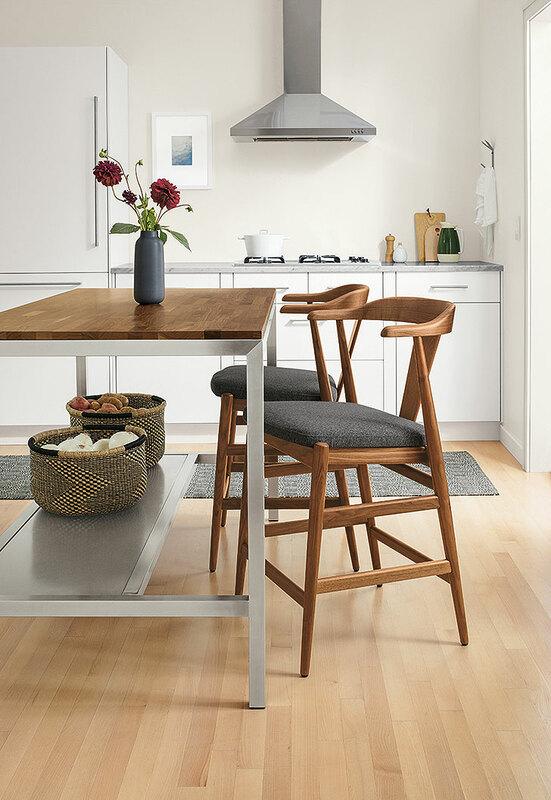 Pull up a seat with our Wolfgang dining chair that brings casual comfort to your dining room or kitchen at a great value. The curved lines and clean profile of the Wolfgang chair make it the ultimate modern seat. You can choose from grey, oatmeal or ink fabric to pair with either a chrome or black powder-coated steel base. For a contemporary look that makes for versatile seating in a dining room or kitchen. Plus, they’re light and stackable, creating more space instantly! Our Fleming Storage bench was designed with small space in mind. 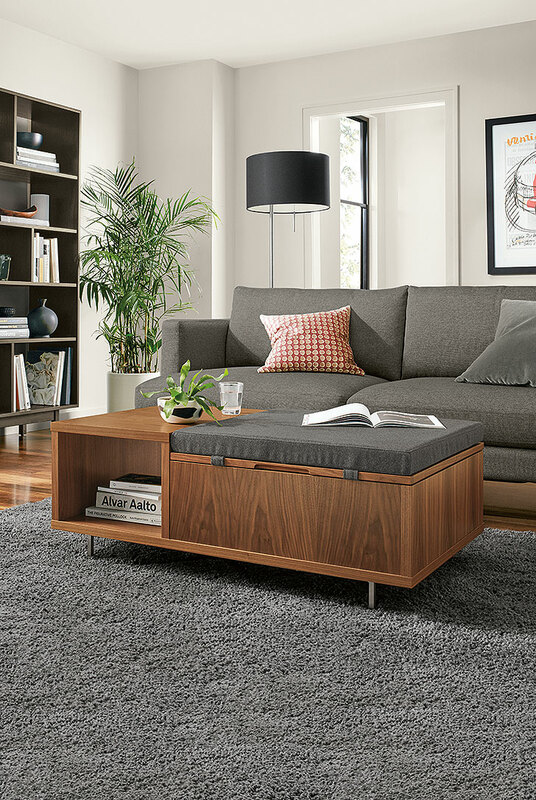 The Fleming coffee table and storage bench combination is both a seating and storage solution. Making it a versatile addition to a small space or any room of your home. A mix of wood, fabric and steel gives Fleming a modern and eclectic look, while the bench’s soft-close hinges enhance its safety and durability. Make a statement with the Adrian storage cabinet. Louvered center drawers crafted from a solid wood panel add unexpected texture and feature push-to-open functionality. Sleek soft-close doors on either side balance out the design. Hourglass door knobs are the delicate detail on the cabinets that are entirely of domestically sourced solid wood. It sits atop a unique X-base steel frame with rounded tube legs that playback to the soft shape of the hardware. Glass shelves and doors bring a beautiful mix of materials and keep the cabinet open so you can showcase your items. 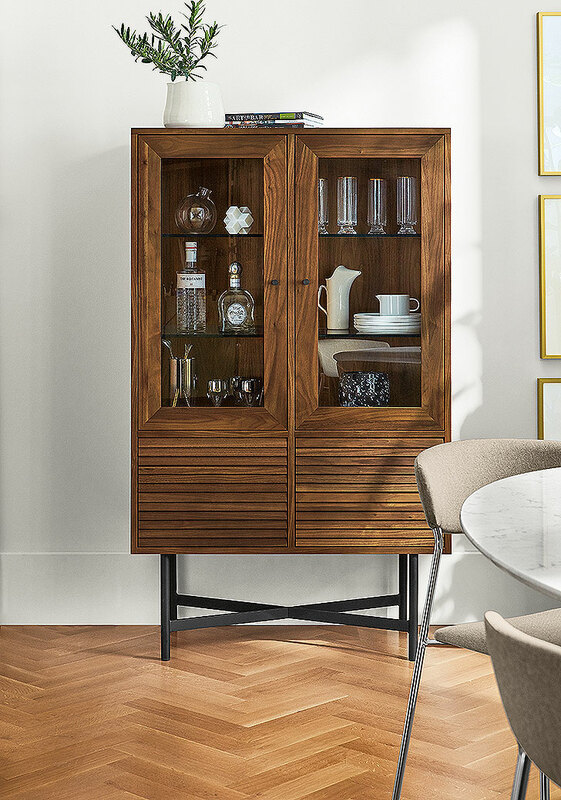 Traditional design gets a modern update with the Kieran storage cabinet. 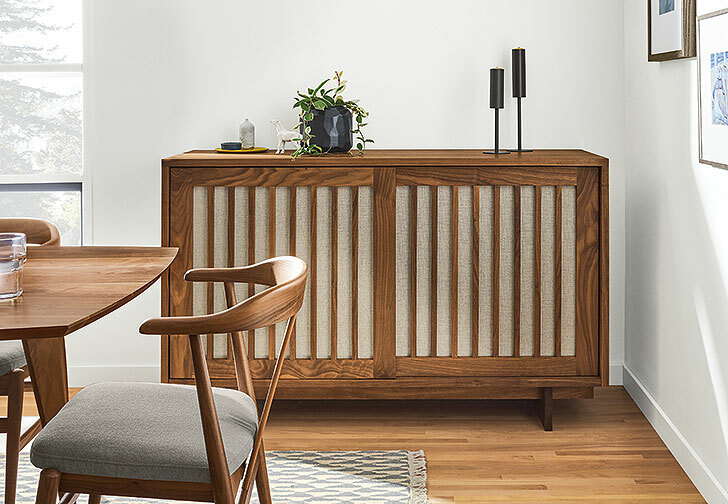 The result is a George Nakashima-inspired, versatile storage piece that will make a timeless statement in your home for years. Fabric door panels add texture to the piece and encase a solid wood frame, and rest on a solid wood base. Finger joint construction is an admirable detail on the sides of the cabinet and a testament to the craftsmanship. A hand-applied oil-and-wax or clear lacquer finish applies to bring out the natural luster of the domestic wood. 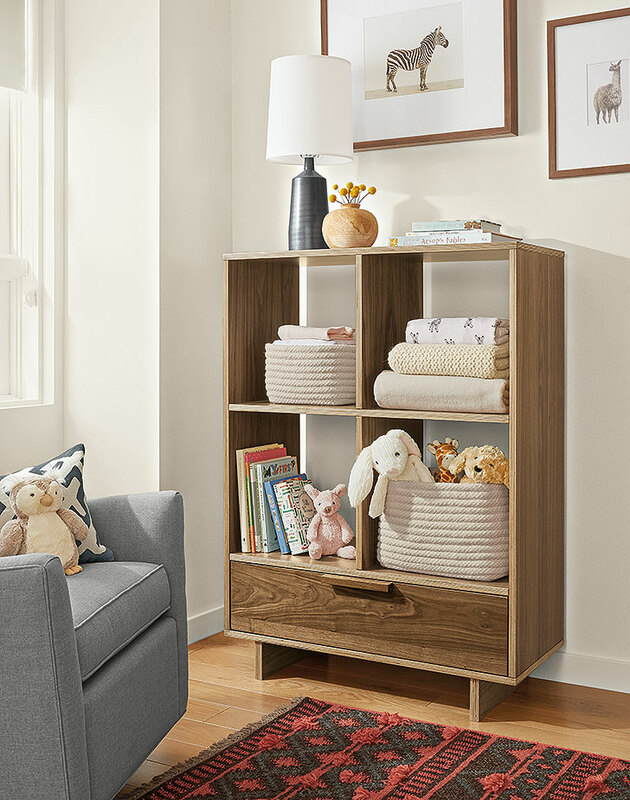 The Ashby storage cubby is inspired by mid-century design details making it a great fit for any bedroom, playroom or entryway. A family-owned shop in New York builds each storage cubby from domestically sourced wood and exposed edge plywood. You can see it along the top, sides, base, and legs for a uniquely modern look with design contrast. Rounded corners and a softly shaped headboard make the Emery storage bed one of our coziest upholstered beds. Expert tailoring gives Emery a clean, chic look, while the slightly sloped headboard offers comfortable read-in-bed plushness. A deep lacquered drawer extends from the footboard to easily store whatever you need. Small space leaving you stumped on decor items? Our expert Design Associates can help you make the most of your space in unique ways. Take advantage of our free design services today.